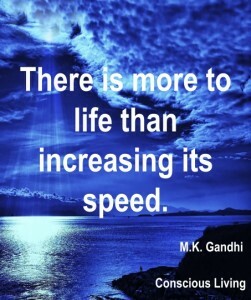 Gandhi once said “There is more to life than increasing its speed.” Some folks don’t believe in it. They think there is more to life than decreasing its speed, especially when it comes to going on a shopping and spending spree. For them, if they slowed down, the stores would somehow get empty and there will be nothing left for them. The retailers help them keep spending. They use different kinds of psychological maneuvers to get customers in the store and “force” them to buy. For retailers, it doesn’t make one bit of difference you buy it or somebody else. But they would give you the impression if you don’t buy it, the item will be gone as if the retailer is going to burn it. The retailers have done all the research. Psychiatrists, psychologists and other experts are working for them as employees and consultants. They have all the financial weapons you can think of to destroy some folks, financially as well as their marital life. It’s their job. The retailers must survive and make profit. That’s the reason they are in business of selling. By default, you are vulnerable to their selling methods. You must be on a look out what you really need to buy and what not to buy. You must be selective in buying. The retailers are happy the most with those customers who buy on impulse. There are retail techniques you should be aware of. Most consumers are conditioned to think life is hectic, fast-paced, fractured, hurried. They believe life should be lived at break-neck speed. They even risk their lives in cars, rushing from one place to another. We all do one thing after another, multi-tasking and switching between tasks as fast as we can blink. The problem with this kind of life is that we put our lives and others’ in jeopardy. We are advised by the industry to produce more, not necessarily better. Producing quantity at the lightening speed without regard to quality is the order of the day. Quantity and quality, most of the time, are at the opposite ends of the production spectrum. If industries produce at the fastest speed humanly possible, quality will bound to suffer. But they take their chances. However, life does not have to be this way. In some cases, it can be counterproductive. If we go out shopping and spending, we will miss the quality in merchandise if we are just out to satisfy our quantitative urge of buying. If our goal is to create quality over quantity in our shopping, then rushing is not the most effective way to work. Take golf, for example. Clearly the sport requires quality products to be enjoyed to its fullest. Keep in mind that quality does not always have to cost you an arm and a leg. One smart way to snag high-end products for less is by using the internet to look for discount deals. This Callaway apparel coupon code is a prime example. Slowing down and focusing on your finances and on what you really need is always more effective. It’s good to buy an item on sale but only when you actually need it. When you slow down, you can focus better on distraction from shopping. Rushing will make you buy things you don’t need. You can appreciate things better when you slow down. The old adage: “Stop and smell the roses” is always good. That would give you real enjoyment in life. You are under a lot less stress when you stop rushing. Rushing makes you stop thinking. You are bound to buy items you absolutely don’t need. You are bound to make mistakes. Some folks think they will buy and if they don’t need, they will return it. It’s a waste of your time, energy, and money when you drive to the store. Don’t rush shopping. Take your time. Best of all buy what you actually need. Don’t sacrifice quality over quantity.